Eight memorable films from one of the most decorated directors in cinema history come together for the first time in the Steven Spielberg Director’s Collection, available on Blu-ray (RRP £59.99). Spanning over 40 years, Steven’s career began as a teenager when he made his way onto the Universal backlot and befriended studio executives. His passion and talent quickly developed, allowing him to direct an unprecedented number of blockbusters. To celebrate the release this coming Monday (13 October), we have TWO copies to give away to our readers, kindly provided by Universal Pictures UK. This is an exclusive competition for our Facebook and Twitter fans, so if you haven’t already, ‘Like’ us at facebook.com/CineVueUK or follow us @CineVue before answering the question below. Steven Spielberg is set to direct a big screen, 2016 version of which classic children’s story by author Roald Dahl? 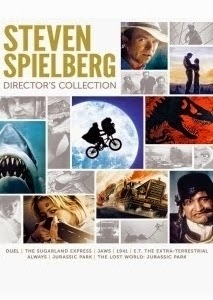 The Steven Spielberg Director’s Collection is released on Blu-ray from Monday 13 October via Universal Pictures UK. This competition closes at 6pm on Thursday 16 October 2014. • ©2014 Universal Studios. All Rights Reserved.